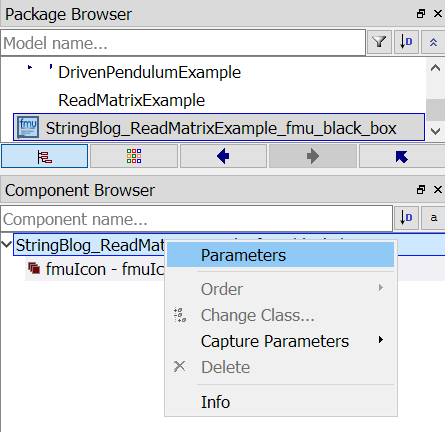 This blog post looks at exporting models as FMUs containing string parameters and modifying those string parameters in the FMU before simulating. The string parameters can be edited by right clicking on the model in the Component Browser and selecting Parameters or by editing the string parameter in the FMU model. Note: if the size of an array is dependent on the string parameter then Dymola will generate an error during translation. A workaround for this issue is to set the array size in the model manually, but this generally will only work when the array size does not change. In Dymola versions before Dymola 2019 FD01 setting the string parameter using the Component browser to ModelicaServices.ExternalReferences.loadResource(…) causes Dymola to crash. This issue should now be fixed in Dymola 2019 FD01. The VeSyMA TerrainServer library makes it possible to obtain data from high fidelity sampled tracks by interfacing with the rFpro TerrainServer. In the closed loop driver example (TerrainServer.Experiments.Examples.ClosedLoopExample), a vehicle is driven in closed loop around a track. In the following case the ClosedLoopExample is exported to an FMU in such a way that the vehicle could be driven around any specified track following any specified path. In the code above the fileName and trackName parameters are propagated to the top level and the annotation Evaluate=false is used. Also road.animation is set to false as this road animation generates an array with a size that is dependent on fileName. Then the ClosedLoopExampleForExport model was translated into a FMU, with Export with string parameter selected. Then the ClosedLoopExample FMU was imported into Dymola.